The Z370 Krait Gaming LGA 1151 ATX Motherboard from MSI is built on the Intel Z370 chipset, supporting 8th generation Intel Core, Pentium and Celeron processors with an LGA 1151 socket. It has four DDR4 slots that can hold up to 64GB of dual-channel RAM at speeds of up to 4000 MHz and above when overclocked. For storage, there are six SATA III ports and two M.2 slots, both of which can operate at speeds of up to 32 Gb/s when used with a compatible NVMe drive. While this motherboard does have HDMI and DVI-D for onboard graphics, it's also equipped with three PCIe 3.0 x16 slots for dedicated GPUs as well as three PCIe 3.0 x1 slots for additional PCIe-based hardware. Other notable features include Realtek ALC1220 7.1-channel HD audio and Intel I219-V Gigabit LAN. The Z370 Krait Gaming is built with RGB lighting that you can customize using MSI's software. Choose from multiple lighting effects and millions of colors to fit your style, and even sync it with other RGB-compatible product with Mystic Light Sync. This motherboard is equipped with six fan headers with DC and PWM support for complete fan control. Have them run automatically or manually adjust the fan speed within BIOS or a third-party software to find a balance between performance and noise. If you aren't getting the graphical fidelity and frame rates you want in your games, you can install additional graphics cards on this motherboard for enhanced performance. It supports up to 2-way NVIDIA SLI and 3-way AMD CrossFire. 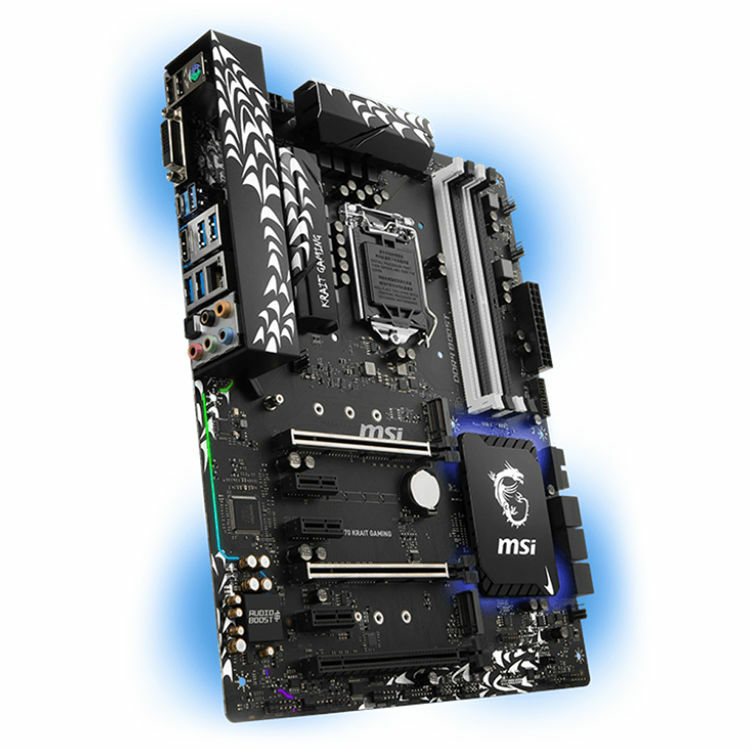 Equipped with HDMI and DVI-D, this motherboard can be used with processors that have an integrated graphics chip for video output. There are six SATA III ports on this motherboard designed for traditional 2.5" and 3.5" drives. Moreover, it's also equipped with two M.2 slots that can utilize the PCIe 3.0 x4 interface for speeds up of up 32 Gb/s when used with a compatible NVMe drive. For an additional boost in performance, you can enable X-Boost within MSI's software. The DDR4 memory slots on this motherboard are built with an optimized memory layout to offer stability, performance, and low power consumption. Additionally, this motherboard supports XMP for enhanced RAM speeds. Audio Boost - Delivers an enhanced and immersive listening experience with multiple hardware and software features. Isolated Audio Design - Physically isolated circuitry ensures better audio signal. Separated Audio Layers - Separated layers in the PCB provide better sound quality for left- and right-audio channels. De-Pop Protection - Eliminates loud popping sounds when plugging or unplugging devices, or turning your system on or off. Dedicated Audio Processor - An EMI-shielded HD audio processor offers enhanced sound quality for both stereo and surround sound. Box Dimensions (LxWxH) 14.0 x 11.0 x 4.0"